Richard Maculley was born on January 31, 1924. His parents George and Mary lived in Chester, Delaware, Pennsylvania. Here Richard grew up together with his brothers Robert and Raymond and sisters Isabelle and Dorethy. His father worked at Sun oil Co. and died in an explosion on september 11, 1944. His mother died in 1947. Richard was a student at Chester High school when the US was drawn into the war. Hij quit High school and enlisted for the airforce on May 20, 1942. He was trained for radio-operator and he and the rest of the crew were assigned to the 91st Bomb group. He left for England to join the 401st squadron. He flew his first mission on May 14, 1943. The 91ste Bomb Group (Heavy) was activated on April 15, 1942 on Harding field. The group had 4 squadrons 322, 323, 324 and 401st squadron. The crews departed to Gowen field, Idaho on August 24, 1942 after training on McDill field, FL and Walla Walla airbase. On Gowen field they received their B17's. It took till October before there were enough B17's available for the group. The first squadron already departed at the end of September to England. The ground echelon also left for England in September on the Queen Mary. From October 1942, Bassingbourn, England was their base. The first of 340 missions was flown on November 7, 1942. 9591 sorties and 22142 tons of bombs later, on April 25, 1945 the European campaign ended for the 91st Bomb group. In total they lost 197 aircraft and 1010 crewmembers. They were awarded with a presidential citation for 2 missions. In June 1945, the 91st Bomb group returned to the US and was planned for the pacific. 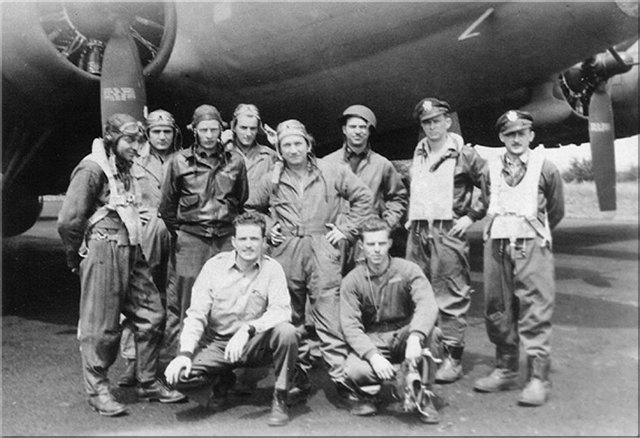 When the war against Japan ended the 91st Bomb group was de-activated on November 7, 1945. On Monday morning the 22nd of June 1943 the bombers of the 91st Bomb Group departed from their base Bassingbourn in England. Their target was a chemical plant in Hulst, Germany. B17 #42-29536 "Mary-Ruth" flown by 1st Lt. Kenneth Brown flew it's 7th mission to Germany. On approach they were attacked by 6 FW190's, lead by Emil-Rudolf Schnor, wich took off from Schiphol airbase in the Netherlands. The attack caused heavy damage to the cockpit and engine #4 was on fire. The "Mary-Ruth" broke out of formation and the Germans fired more 20mm rounds at the aircraft. 1Lt. Brown gave the order to abandon the plane. T/Sgt. Akers just left the top turret when this exploded causing exploding munition to fall in to the cockpit. 1st Lt. Brown fought to keep te plane level while exploding munition burned his face. The right wing now was completely on fire. Inside the aircraft the crew did not manage to get the hatch open and they had to drop 2 bombs so they could leave through the bombdoor. Then the aircraft exploded and the crew was thrown into the air. 8 of them miraculously survived, Richard Maculley and William Allen didn't. 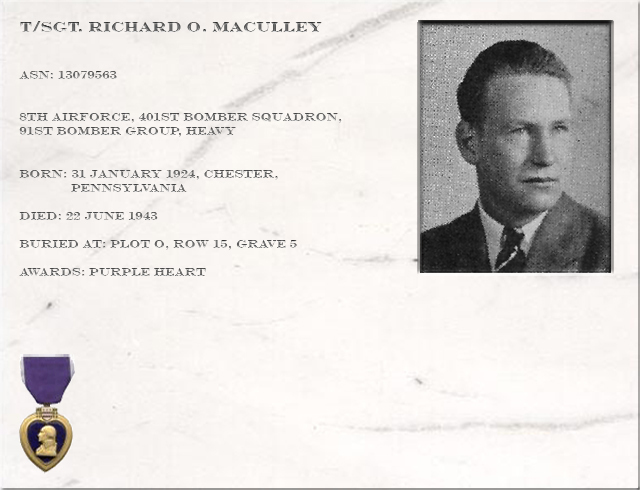 Crew of B17 # 42-29536 "Mary-Ruth"
Maculley and Allen were buried at the local cemetery of Wulfen, the others were taken prisoner and deported to different STALAG's. 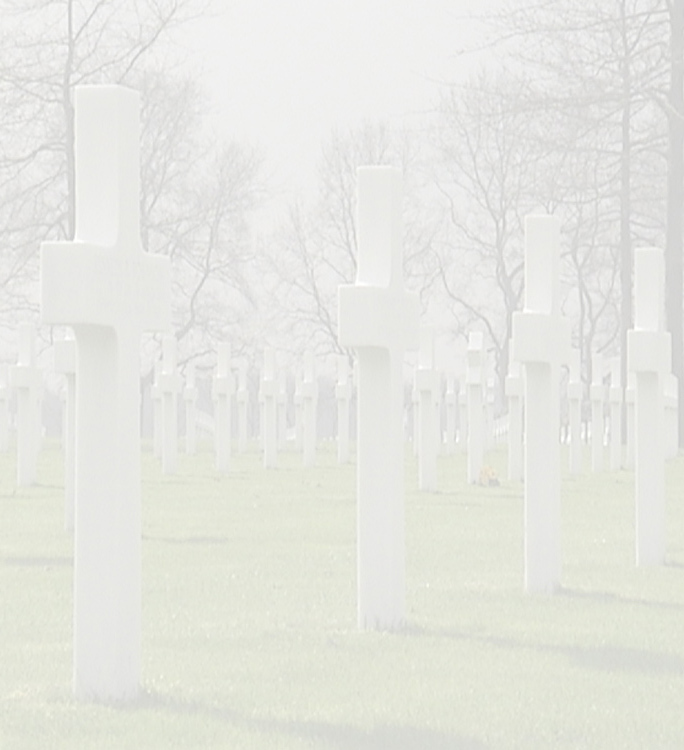 After the war Richard Maculley and William Allen were brought to the Margraten cemetery. 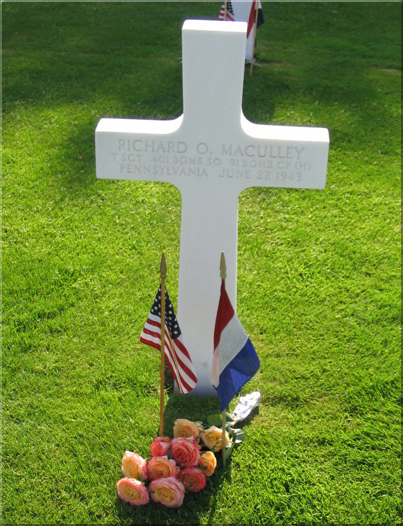 At first Richard Macully was buried at II - 8 - 197. With the construction of the recent cemetery, after repatriation, he was finally laid to rest at O - 15 - 5.